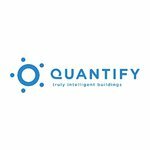 Last year Quantify Technology’s (ASX:QFY) focus was predominantly on the low energy, sustainable-living applications of its ever-evolving technology designed for intelligent buildings. But in the back of this small cap’s mind has been even bigger markets, as it looks to expand its business as a provider of holistic Internet of Things (IoT) solutions in the intelligent building market. The company recently hired two new independent Board members to broaden its global footprint in this market and, in particular, the aged care and disability sectors. 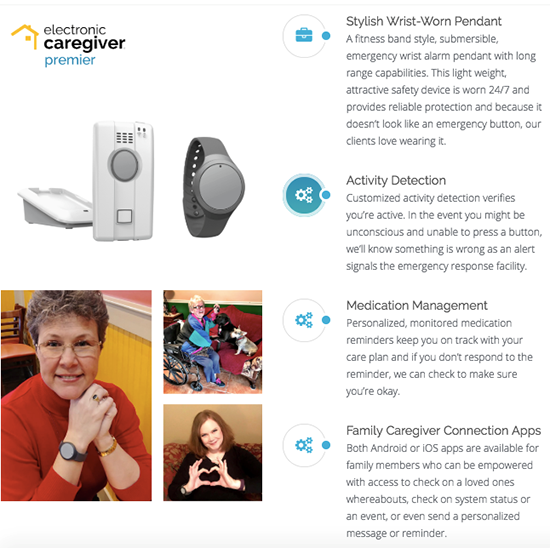 Through its patented IoT platform and devices, QFY’s technology would allow caregivers to deliver in home living assistance more effectively and efficiently (through aggregated data from connected devices), and allow them to focus on better living outcomes for those needing assistance. The company’s technology can also assist in maintaining a safer, independent lifestyle for longer. The company’s MD, Mark Lapins, came to the company with a decade of experience in innovating and delivering technology solutions to retirement living. So it’s no wonder that QFY is already clocking up deals in this space. Last month, it signed with US-based Electronic Caregiver LLC (ECL) for the development and distribution of a collaborative solution for the US and Australian markets. ECL provides safety and security options for the elderly and chronically ill by reducing medical complications, lessening deaths, and providing wellness support — all via a combination of education and technological solutions. The partnership with QFY will make use of the data collection and control capabilities built into QFY’s platform. There are obvious benefits for aged care. If you want to be sure that your elderly father hasn’t left the stove on, for example, you can use a Quantify Technology device that’s able to check on his kitchen appliances. This is not only a feasible idea, but a present reality. Assisted living and retirement care are some of the fastest growing markets. An IBIS World report lists aged care residential services alone as a $19 billion industry, with annual growth of 5.6% over the last five years. At the same time, technology is now in a better position to help retired and ageing people live independently. There is a long list of increasingly affordable apps and devices, which brings endless possibilities for aged care and beyond. It is no surprise that QFY has targeted the industry in a bid to help it come to terms with what the age of IoT can actually do for those that need it most. Of course this is an early stage play into this sector for QFY, so investors should seek professional financial advice if considering this stock for their portfolio. Aside from aged care and assisted living, QFY has also been working hard on other fronts. In March, QFY announced a multi-faceted deal with Greaton Group (includes Haneco Lighting and Lucesco Lighting), comprising licensing opportunities for QFY’s platform to Greaton companies and potential product distribution to Greaton Group’s extensive portfolio of hotels and other development projects, as well as via its network of partners. In the same month the company announced its Q Device had been installed in an entire apartment development in Lindfield on Sydney’s Upper North Shore. Apartment buyers will receive Amazon Echo Dot hardware and QFY’s Qumulus Skill for Amazon’s cloud-based AI product, Alexa. QFY is at the forefront of the rapidly growing IoT market, with its commercially available Q Device, which replaces standard power outlets and light switches without needing to rewire, and which can be used to build the foundation of IoT solutions in homes and workplaces. 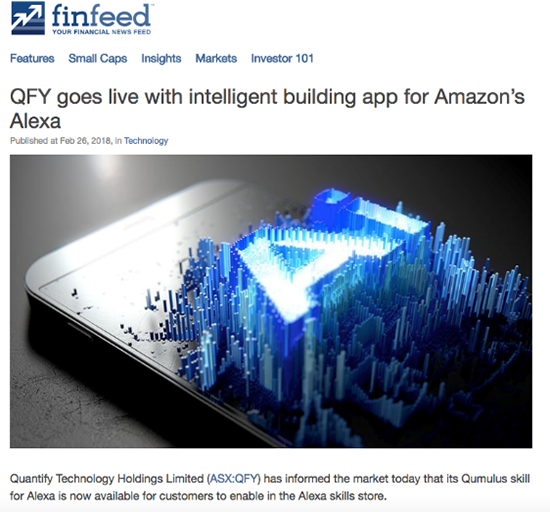 QFY launched its Qumulus Skill in Amazon’s Alexa Skills Store in February — a major milestone as the company looks to rapidly increase uptake and distribution of its platform, with a focus on voice controlled IoT tech in living spaces. It has been a busy few months for QFY, with further news expected. Quantify Technology (ASX:QFY) is moving ‘full steam ahead’ with its penetration of the aged care and retirement living markets as it looks to expand into new markets with its technology. It thus seems apt that the latest, and biggest, news from the company relates to its agreement with Electronic Caregiver LLC (ECL). ECL collect and analyse valuable scientific data which can be used to develop wearable, mobile and video applications that can help older people and the chronically ill get through everyday life. Its focus is on safety and security to help avoid falls and other medical complications, and improve quality of life and health — and ideally extend individuals’ lifespans. The fact a well-established player like ECL (in the business for nearly 20 years) wants to partner up with QFY is a good indicator that the A$5.7M-capped play is on the right track. Through the collaboration, QFY will look to enhance what ECL already offers its client base, while ECL will work to secure licensing deals and get its hardware and platform in front of as many eyes as possible in the fast-growing retirement living and aged care market. The idea here is that through the collaborative process, ECL’s existing product portfolio will be significantly expanded and enhanced via QFY’s cutting edge data collection and control capabilities. ECL has some hefty contracts in place with large hospitals, medical institutions and leading health service companies like Vantage Healthcare Network, Mid-Delta Home Health & Hospice, Total Health Care, Unity Health Systems and others. This announcement is key, with QFY’s honed in focus of the aged care and retirement living sectors. The deal also opens up a beachhead from which to launch QFY’s Intelligent Building Solution to the US market. According to the Population Reference Bureau, the number of Americans aged 65 and older is projected to more than double from 46 million in 2016 to over 98 million by 2060. That makes the US a clear favourite in terms of QFY’s initial target markets. Although how much of this market QFY is able to attract remains to be seen, so investors should take all publicly available information into account and a cautious approach to any decision made with regard to this stock. 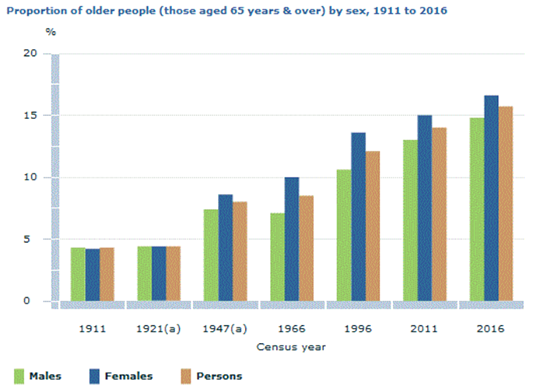 As you can see from the table above, the trend is certainly moving towards a community of older generation Australians and they could all benefit from technology designed to help their needs. As of February, QFY’s Qumulus skill for Alexa has been available for customers to enable in the Alexa skills store. It’s passed Amazon’s certification requirements and is now part of the growing suite of apps under development by the company. The pairing of these two particular technologies (Qumulus Skill and Alexa) sets the standard for control technology. This acts as a pretty strong endorsement for the capacity of QFY’s tech to integrate smoothly with others. Qumulus Skill can be used with any Amazon Alexa-enabled product (like Echo) to deliver advanced and feature-rich control of living spaces using conversational voice commands. It goes without saying that this is a key step — being literally able to talk to your home — along the company’s path in creating a platform for ‘truly intelligent buildings’. Voice control also has particular benefits for elderly people and those with disabilities who may have difficulty with constant hands-on use of a device. Alexa is Amazon’s cloud-based AI product, with similar characteristics to Apple’s Siri or Google’s ‘Google Assistant’. Users can now search for and install the Qumulus Skill on the Alexa Skills store. At this stage of QFY’s game plan, it’s all about clocking up deals with bigger players. Which is why news that QFY had signed a deal with Greaton Group was particularly positive. Greaton Group includes the Greaton, Haneco Lighting and Lucesco Lighting brands, with a portfolio spanning hotels, residential and commercial development projects. It brings new designs and architectural partnerships to the Australian property market, and recently secured the A$730 million development project ‘The Ribbon’ in Sydney’s Darling Harbour. That’s not its only multi-million dollar project, either. The MoU means that the two companies will progress towards licensing opportunities for QFY’s platform while also developing additional IoT products together. Greaton Group’s existing network is already in excess of 600 partners, so the scale of this opportunity is hard to overstate. A key element of the agreement is the reference to QFY potentially gaining access to Greaton Group’s volume manufacturing capabilities, both in Australia and China. This is an important factor, as the company has been looking at growing its manufacturing capabilities in response to increased demands for its products. Perhaps most importantly the deal offers a real sales opportunity for QFY to supply Greaton Group’s building developments with its hardware and platform. Greaton has a strong pipeline of projects, and has secured a large urban regeneration project in the Adelaide CBD, as well as the $300 million West Franklin project, and is currently developing a $260 million residential site in Sydney suburb Epping. In March, QFY confirmed that its flagship Q Device had been installed in an apartment development in Lindfield on Sydney’s Upper North Shore. To enable voice control of the installed solution, QFY will provide purchasers of the Linfield apartments with Amazon Echo Dot hardware and its Qumulus Skill for Alexa. The presence of QFY’s tech in a new, high-profile apartment development, right in the thick of Sydney’s illustrious North Shore, is yet another potential game changer for the small cap — given that it provides a model for future projects, and a deeper ability to grow its pipeline of deals by getting noticed by potential partners. The products we are talking about here have the power to revolutionise the at-home experience, for high-needs groups as well as the general population. However, the products are at an early stage of delivery into these sectors so investors should seek professional financial advice if considering this stock for their portfolio. QFY’s device features include passive infra-red motion, proximity, light measurement, temperature, power usage, humidity monitoring and a lot more. The company is looking at integrating an air quality sensor, and that’s just the start in terms of the potential to add endless capability to the platform. Ultimately, the team at QFY is passionate about the easy delivery of IoT solutions to improve everyone’s quality of life; even better if this can radically help with the care-giving provided to ageing people or those with chronic illness. With an ageing population, now is the right time to be developing solutions that allow people to avoid institutional care — an option likely to be overwhelmed by demand in the years to come. With a lot of the hard yards of the initial development done and dusted, QFY’s focus is now on commercialising its platform, expanding its brand and landing as many high-impact deals as possible to bring its name and its unique product suite into mainstream thinking.